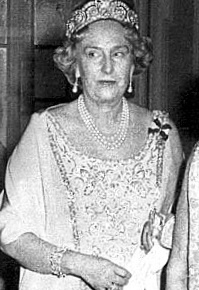 I feel I've been remiss, my sparkly friends: we've only talked about one of the tiaras of the Spanish royal family to date. They don't have the largest collection on the block, but they have some toys to play with for sure. So let's make it all better with what is either my favorite Spanish tiara or my second favorite, depending on my fickle magpie mood: the Cartier Diamond and Pearl Tiara. The tiara is composed of swirls of diamonds surrounding eight large pearls. 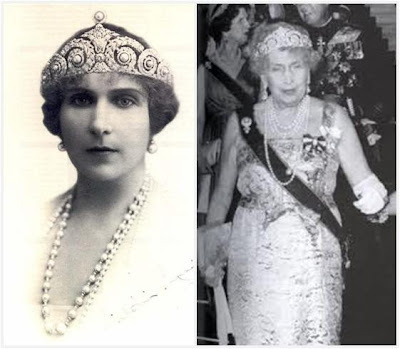 It was made by Cartier, which is no surprise (and not just because it's right there in the name); the design is very Cartier, so to speak - it particularly calls to mind its swirly cousin, the Khedive of Egypt Tiara. This gem belonged to Queen Victoria Eugenia. Ena, as you may call her if you're feeling chummy, was born a princess of Battenberg. One of the many grandchildren of Queen Victoria, she married King Alfonso XIII of Spain in 1906. The tiara did come with an additional pearl at the top, and the pearls could be switched out for other stones - Ena replaced them with emeralds from time to time. 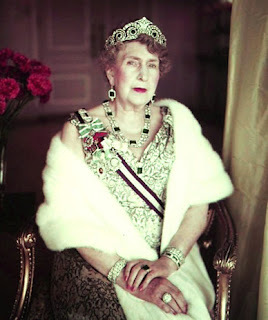 The Spanish royal family went into exile in 1931, and the emeralds in the amazing set she wore alongside the emerald tiara version were among the items sold to make the royal ends meet over the years. The tiara went to her daughter, Infanta Maria Cristina, Countess of Marone. And then it ended up back in the main royal line (some say it was purchased by and some say it was given to or inherited by King Juan Carlos), and is now worn by Queen Sofia. This is one of those tiaras that's larger than you think it would be. Queen Sofia and her family have been sticking to the smaller pieces for some time now, so this one doesn't get worn as often as it should (in my opinion). Since reacquiring it, it had only been seen on Sofia. It was a big surprise, then, when her daughter Infanta Cristina turned up with this on her head for the wedding of Crown Princess Victoria in 2010. Is this your favorite tiara from Spain?